Patented in 2010, the C-lever is a radically new approach to tuning lever design that, by separating the turning and tilting forces applied to a tuning pin, enables an unprecedented level of control over its movements. When a traditional L-shaped lever is placed on a tuning pin, its handle is located outside the plane of the pin block. For that reason, when it is used to turn a tuning pin, it inevitably tilts, or "flagpoles," the pin as well. The extent to which it tilts the pin depends on factors such as the stiffness of the pin, the tightness of the pin in the block, and the distance between the top of the block (or tuning pin bushing) and the string coil. Tuners learn from experience how much their L-lever will tilt in a pin in various situations, and compensate for the variation in tilt as they work. When a C-lever is placed on a tuning pin, its handle is located in the plane of the pin block. For that reason, a tuner using a C-lever can choose to turn a tuning pin without tilting it at all, completely eliminating a source of variation in the feel of different pins. The tuner can also choose to to tilt the tuning pin without turning it; or, to combine turning and tilting forces in any proportion. Pushing the handle of this imaginary lever turns the pin without tilting it. 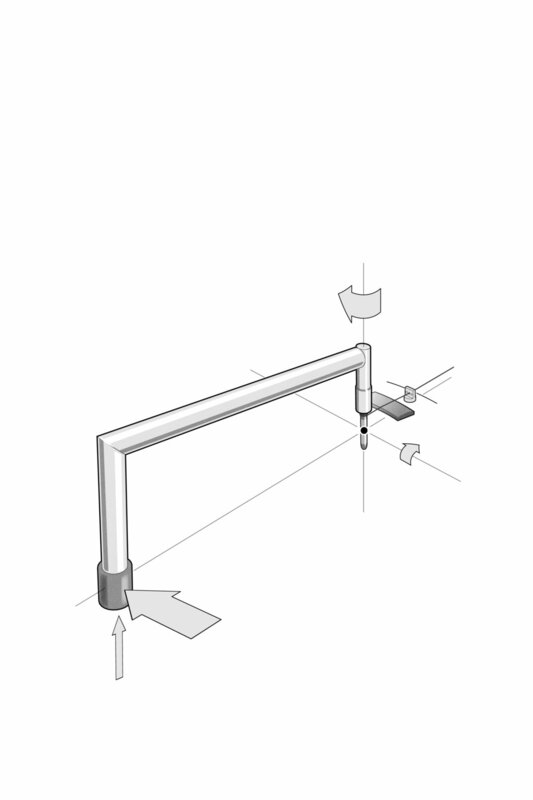 Pushing the handle of this imaginary lever tilts the pin without turning it. When you push the handle of a conventional, "L"-shaped lever, you both turn and tilt the pin, with a fixed proportion between the two forces. 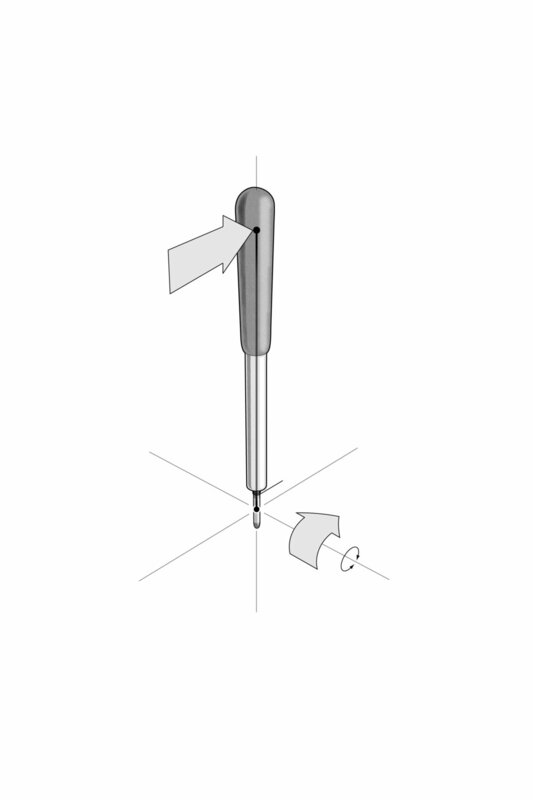 When you use a "C"-shaped lever, you can choose to turn the pin without tilting it, tilt the pin without turning it, or simultaneously turn and tilt the pin. "I have been using the new lever for a few weeks now and I love it. It has helped my shoulder pain a great deal as well as making my tunings more stable than ever before. Within a few days I felt comfortable enough with the lever to do a concert tuning with a time window of only an hour." "The C definitely improved the sense of what the pin is doing, and I am better with the regular hammer now." "With the pro-lever I could tune the grand pianos without pain or spasms." "I feel more directly in contact with the tuning pins and have more control over their movement." "Being both a Piano Technician and a Doctor of Physical Therapy, I would like to weigh in. After tuning numerous different brands/sizes of grand pianos with the Levitan lever over this past month I can truthfully say that it takes pin control and ergonomics to a new level. It makes it extremely easy to finesse the pin in both rotational and horizontal planes, while allowing the technician to remain in a functional neutral posture that places no strain/wear and tear on any of the upper extremity joints, as tends to occur when using traditional tuning devices. Based on my own experience with this lever over the past month, I can unequivocally, and enthusiastically, endorse it." "It lets me tune up to note 88 without having to stand on the side of the piano at the treble end, as I used to do." "I am pain-free for the first time in years!" "Being able to sit with my spine perfectly straight is a wonderful advantage, as is being able to brace my arm against my chest for support and added strength, instead of having my arm extended away from the body with no support, at an awkward angle that puts a heavy strain on all the muscles involved." "I can tune without raising the lid on grands, which is often preferable if there is a lot of junk stacked on the piano that the owner prefers not to move, or is too time- consuming or risky to move (valuable sculptures, family photos, expensive audio equipment, etc.)"